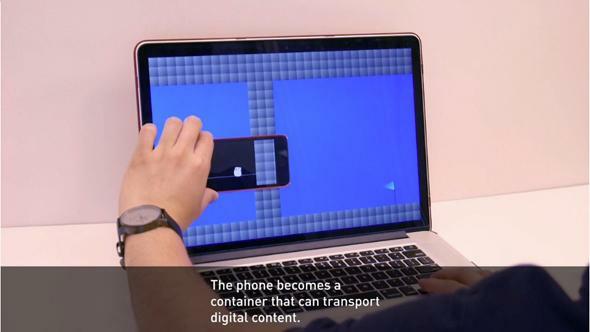 THAW from the MIT Media Lab lets smartphones interact and become a part of other screens. The phone merges with the computer screen. Researchers from MIT Media Lab’s Tangible Media Group and Fluid Interface Group are working on a project called THAW that allows smartphone cameras to identify what’s happening on another screen and interact with it. You can use the touchscreen of the smartphone to highlight files on a computer screen and drag them onto the phone. You can also continuing playing a video game on your smartphone that you started somewhere else. THAW detects position using a smartphone’s camera and a color grid on the bigger computer or television screen. And once the smartphone sensors place the other screen, you can, for example, pinch to size objects on the other screen using the smartphone. The video above shows THAW’s proof of concept, but long-term the possibilities for the approach are basically endless. If the digital world feels ubiquitous now, this could facilitate a universality for things like seamless file sharing, video games, and work setups that isn’t possible now. And you could finish reading an article and watching a movie on your shirt sleeve screen while you commute in your driverless car.